If you experience problems generating the PDF files, you can set the PDF Writer into DEBUG mode. Debug mode is activated by creating a simple text file named debug.txt. There is not need to put any content in the text file. The file must be placed in the program folder of the PDF Writer. 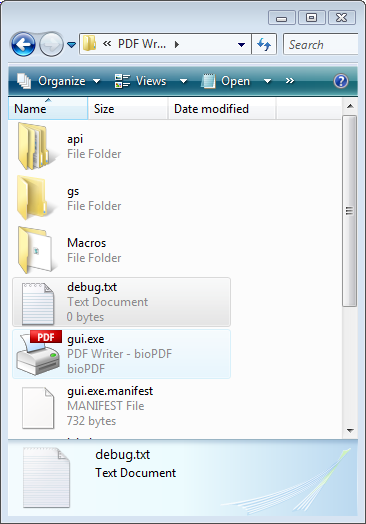 A typical location of the program folder could be "C:\Program Files\bioPDF\PDF Writer". You should create a zip file containing these files. In addition to the files in the folder this folder, you should also include the port.log and status.ini from the folder above in the zip archive. Please note that if your PDF creation is running in a service context or as a shared printer, then your temporary files may be located under one of the service accounts. 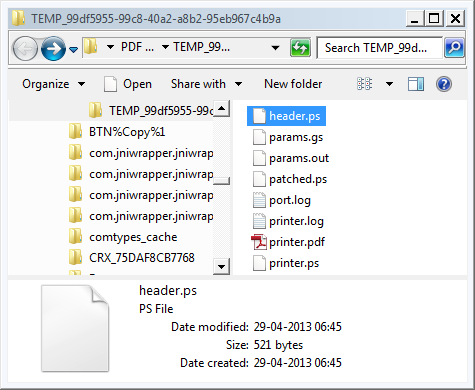 With the zipped debug files ready you can send an email to and attach the zip archive. It is very important that you make a good description of the problem. If the problem is easy to reproduce then you should make a description of the steps needed to do so.